These are really easy and really delicious. My husband said he would marry me all over for these enchiladas. :) Obviously, that means we will be adding them in to the rotation from time to time despite them not being quite as healthy as I prefer. 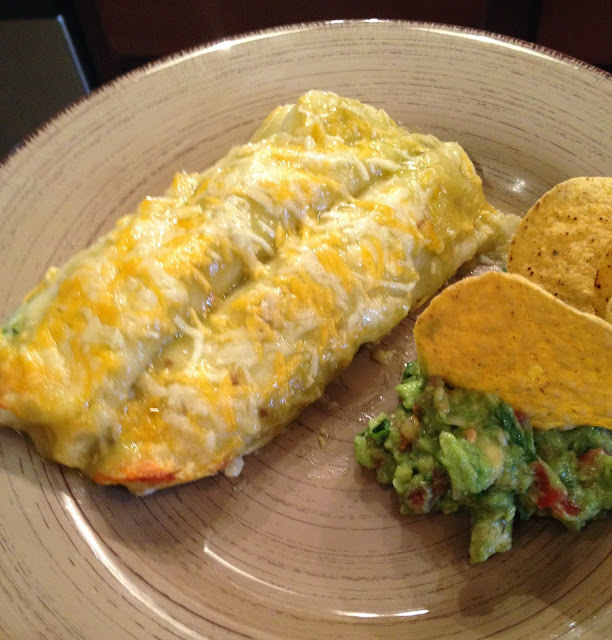 The cilantro makes these enchiladas have such a wonderful and distinctive flavor. Cilantro is one of those things that has grown on me over the years and now I really enjoy it. However, it's been my husband's favorite for a very long time and he is drawn to any menu item or recipe that includes it. The first time I made these, I used some smoked turkey breast I had on hand (I do not mean deli meat) and they were a hit - think Thanksgiving leftovers! Chicken or turkey...whatever you choose will be great. You can also make these ahead and freeze them before baking. Combine chicken, sour cream, 1 c. cheese, onion, cilantro, salt, cumin, and oregano in a bowl. Warm tortillas until pliable and easy to roll (you can do this by frying them in a skillet or microwaving them. Place meat mixture in tortillas (1/4-1/3 c or so) and roll tightly. Place in a lightly greased 9x13 pan with the seam side down. Pour the enchilada sauce over all - making sure to spread with a spatula if needed. Top with 1 c. cheese. Bake at 350 degrees for 30-40 minutes.